Editor’s Note: We thank Kay Ryan for kindly allowing Persimmon Tree to publish these poems. They appear in her book, The Best of It: New and Selected Poems (New York: Grove Press, 2010). can cost what it cost Orpheus. his napkin stained the most delicate colors. this was a conscious unkindness. that we must say, You must stop this. on water as if lying on a pillow? The water cuddles up like Jell-O. Click on the video below to see a film clip of an interview with Kay Ryan on PBS in 2006. 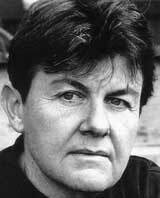 Kay Ryan has published several collections of poetry, including The Best of It: New and Selected Poems (Grove Press, 2010); The Niagara River (2005); Say Uncle (2000); and Elephant Rocks (1996). She has also received numerous awards, among them the Ruth Lilly Poetry Prize, a Guggenheim fellowship, an Ingram Merrill Award, and a fellowship from the National Endowment for the Arts. Her poems and essays have appeared in The New Yorker, The Atlantic, Poetry, The Yale Review, and Paris Review, among other journals and anthologies. In 2008 she was appointed the Library of Congress's sixteenth Poet Laureate Consultant in Poetry. lies in her ability to beat truth out of the fewest possible words. A seashell from the sands of time. The spinning wheels of time. The spirit is made whole. Pingback: In Defense of Rhyme In Poetry | Art by Heck! Pingback: Kay Ryan, “Insult” | Rethink. These poems are brilliant, captivating, unique and transcendent in their content and language!!! Kay Ryan is extremely intelligent. I’m a poet and am not easily impressed by other contemporary poets. But she is a genius and an artist who more than deserves all her accomplishments. I feel my efforts very small. She was born with a gigantic talent!! Thank you. Thank you for sharing your poems. You have lifted me and opened my eyes to my own wisdom. I was given this poem after I lost my job. It totally rebuilt my spirit and got me back on track. It’s called a magic poem because of the way the words affect people, I just think it’s Super Inspiring.